During this hands-on evening, using the traditional Japanese bamboo rolling mat, learn all the skills and techniques you need to create your own selection of homemade sushi! Do you love buying sushi for lunch, enjoy eating at Japanese restaurants for dinner, but think sushi is too difficult to make at home? Well, think again! Making your own sushi is actually pretty simple. . . . using basic (and inexpensive!) equipment and ingredients, you can easily create an array of delicious and beautiful looking sushi that will WOW your family and friends. And it’s healthy too. Using the traditional Japanese bamboo rolling mat, our tutor Rashmita Shah will share her culinary skills and passion to show you all the skills and techniques you need to make your own selection of homemade sushi! 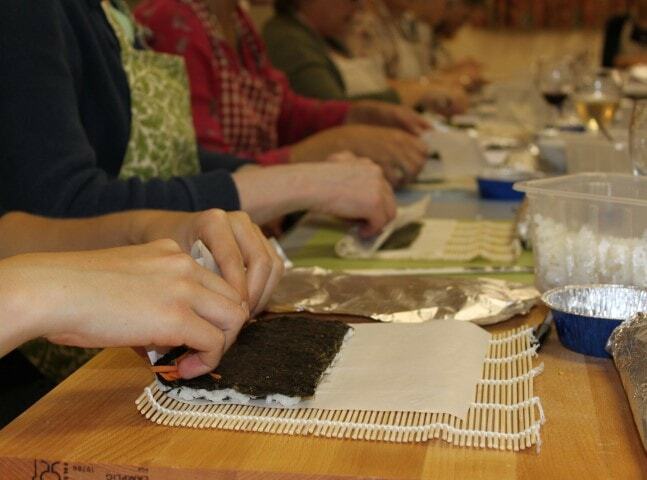 During this hands-on evening, you start by learning how to make the perfect sushi rice, then use this to create a maki roll wrapped in nori (seaweed) and an inside-out sushi roll known as Uramaki. When you have mastered the basic skills, you can use your imagination and all the ingredients available to create your own bespoke range of sushi. At the end of the evening when all the cooking and rolling is complete, you’ll get to try all of your creations as we sit down to a banquet of homemade sushi …washed down with a glass of wine (or saki if you prefer)! The number of attendees on this workshop will be limited to 15.